the metal needles is very squeaky! What do you think ugly or not? 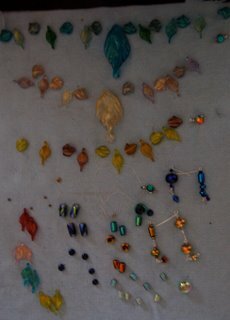 Its very dark here today so the pictures are not fab, these are the beads I was working with today, though I have made a few pairs of earrings too. My mum is nearing the end of her second sock, they are for my brother for christmas (last year) so we were talking about a new project for her, I suggested she knit a pair of Fetching. She likes them so has printed and laminated the pattern ready. She has terrible arthritis in her hands so can only knit a little at a time. I need to look for bamboo needles for her as I am sure they will be better. There is no wool shop nearby, when I was a teenager there were at least 3 decent sized wool shops in town and one in the village where she lives, now nothing, its terrible. Off to search for needles, tomorrow I am definitely writing my christmas list, promise. I’m not really minding Jake’s wool so much. ; ) Looks like a playful pattern you’ve got started with it. I kind of like those colours! I’d like to try some kool-aid dyeing myself. I’ve been wanting to make my own self patterning sock yarn. I’m sorry to hear about your mom’s hands. That must be so painful. Hopefully the bamboo needles will help her. Not ugly! I kind of like it. Congratulate Jake on his dyeing techniques! He is way beyond me on the home made dyeing front! Don’t know what you could knit with it though… And tell your Mum that I’ll take her to the posh West End Knitting shops (and the Barrowlands Bargain Wool Shop!) the next time we are both in Scotland at the same time. Blogger keeps telling me I’m anonymous, so there you go…. mystère et boules de gomme as the frenchies say…. It looks like its just me that thinks its kind of ugly, Jake loves it and can’t wait for me to be finished the 2nd fingerless glove. Jamie reckons it looks like the bread we made that we put smarties in and all the colours ran. 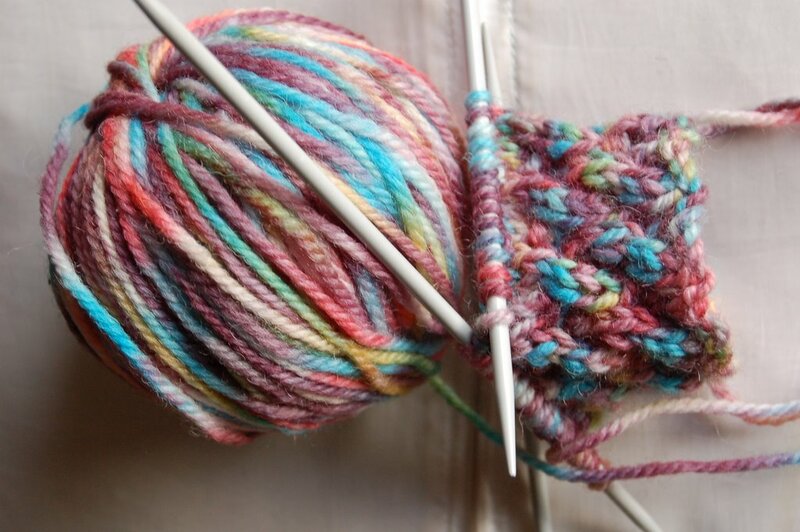 I ordered my mum some needles and a ball of Noro to make a pair of fetchings, so I am hoping it arrives today and she can get started as soon as she has finished the sock. Hi Mandy Anonymous!! We have to do some Kool-aid dyeing with your girls they would love it. I was reading Woolen Rabbit’s latest post and saw your comment. “Wait a minute,” I said to myself, “I don’t remember commenting here.” What a coincidence to find another knitting Yvette. You also don’t capitalize your name on the blog! Your beading is lovely. And all that fabric! Sewing is something I never got the hang of. The beads look lovely, so many pretty colours. I have to say that I rather like the wool colours too! I bet he had a fantastic time playing with the Kool-aid.